Leo Da Silva Lopes needs to play in a more advanced position. 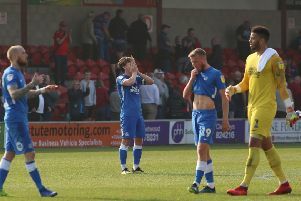 We gave Peterborough United fans 10 words to sum up the first 20 games of the League One season. Not bad, tactical naivety (not ineptitude) costing talented squad dearly. Posh fans give their views on manager Grant McCann. Must give Leo a run in an attacking role. Forward passes, drop Doughty, Leo behind the striker, back four. One Posh fan wants his club to sign John Akinde (centre) from Barnet. Remember we’re a mid-table team with delusions of grandeur. Bang average, but Posh still somehow in the top half. Lower your expectations. Manager and players are average. Try and support team rather than constantly looking for negatives! Chris Forrester for Michael Doughty needed. Play players in their correct positions and make substitutions earlier. Keep the faith. Don’t sell Marcus Maddison. Keeping a settled keeper and defence would help. Start turning up against the teams in the lower half. Hope McCann has a ‘tactics’ manual in his Christmas stocking. Win the ball. Give it to Maddison/Edwards = Top 6. Re-sign Charlie Lee. Clone him. Play him in every position. Not rollercoaster, more a see-saw, often in need of WD40. A season of promise and hope dashed by defensive frailties. Support your team not slaughter them even when winning. Get a target man like Barnet’s John Akinde.